Fabric-backed fitted medical grade sheepskin for all bed sizes. The medical sheep's wool has a fibre density higher than even the very best natural wool - which give it superior pressure redistribution properties. This is achieved by weaving natural wool to a fabric back, and is not to be confused with artificial sheepskins created from synthetic 'wool'. This overlay uses natural wool, treated to ensure it can be repeatedly washed up to 80°C. Plus, because the PC120 overlay has no leather backing, it can be washed with normal household detergent. 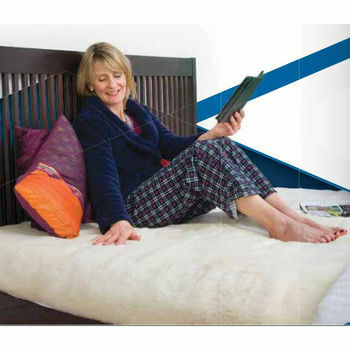 Your Shear Comfort™ overlay provides the ideal microclimate for a good sleep, looking after temperature and perspiration regulation, with the excellent air redistribution properties of a wool product. In a residential or medical care facility, Shear Comfort™ Overlays are a lower cost pressure care solution, and remove the discomfort and noise experienced with plastic based options, such as plastic air filled overlays or alternating pressure mattresses. As our Shear Comfort Original items are backed with natural sheepskin, they require a slightly different washing technique from the PC120, which is backed with fabric. Shear Comfort PC120 does not require special shampoo, and can be washed with normal household detergent up to a temperature of 80°C, although you can use Shear Comfort Wool Care Shampoo to condition the wool and utilise the fungicidal and matricidal properties of the shampoo. PC120 products can be laundered in the same way as Shear Comfort Natural sheepskins.